At some point most pen makers will feel constrained by the design limitations of the pen kits on the market and will want to experiment with making pens from scratch or making serious modifications to kits. For those who wish to do so, finding suitable components can be a problem and it is often necessary to resort to cannibalising kit components. A couple of years ago Drechselstube Neckarsteinach (dns) introduced the dns-TWISTER ball point pens and pencils and the dns-PENCIL artist's sketch pencil. These provided components which gave the pen maker much more scope for individual design variation than the more usual pen kits. Slightly more challenging than the standard mandrel mounted kits they provided a logical next step for anyone wanting to experiment with their ball point pen and pencil designs. 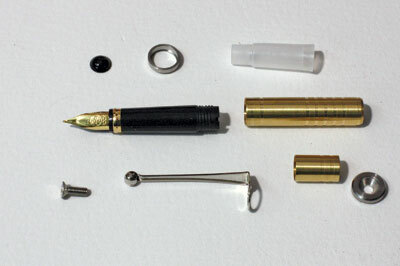 The dns range has now been extended to include a selection of fountain pen components in two types: the dns-JUNIOR which has push fit components for the cap and the dns-MASTER which, with its screw cap fittings and wider range of high quality nib units, gives huge scope for the maker to create a wooden pen with few, if any, design limitations. The dns-JUNIOR costing from Â£13.50 has a choice of bright polished stainless steel or gold plated nib units and the finger grip is black plastic. The dns-JUNIOR is available with a medium nib and uses disposable ink cartridges. It has the same stainless steel clip as the dns-TWISTER pen kits, this being held in place with a Torx head screw which is hidden under a Swarovski crystal which is glued in place in the end of the cap. The dns-JUNIOR fountain pen, with its black plastic finger grip component requires little more skill in making than the usual mandrel mounted kits, except that a little more ingenuity is required in mounting the wooden components on the lathe by means of shop-turned wooden mandrels. It does, however, afford the maker much more design flexibility than other kits where centre band or cap components restrict the sizes of the barrels. The dns-MASTER series costs from £25.60 for a medium width stainless steel nib and clip to an eye-watering £107.20 for an 18ct bi-gold broad nibbed version. These price variations reflect the varying quality of the nib components which are all manufactured by the top German manufacturers, Bock. The other components of both dns-JUNIOR and dns-MASTER series reflect the high standard of the nib units with finely turned brass barrels and top quality Schmidt cartridges and for the dns-MASTER, ink pump convertors. The dns-MASTER pen requires more skill and precision from the maker, the finger grip in particular requiring the production of a fine tube with walls only 1mm thick at the nib end which also limits the selection of timber for this component to those types less prone to splitting. The reward for this effort, however, is almost unlimited design freedom which is further enhanced by the design of the cap components which allow a 'closed end' design either with or without the clip component installed. Annotated drawings with dimensions are available for both pen types. The ones I was supplied with were in German, but UK supplier Phil Irons is working on a translation and by the time this review appears in print, an English language version should hopefully be available. 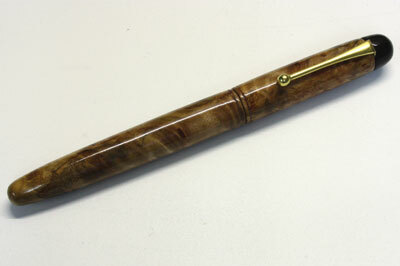 For the purposes of the review I used a dns-MASTER Gold Plated Nib-Medium set of components to create a traditionally shaped pen in burr myrtle (Umbellularia californica) with the black finger grip and end-cap components from some unidentified timber offcuts which may be African blackwood (Dalbergia melanoxylon), ebony (Diospyos spp.) or even very dark bog oak. I really should take more care to record the species of my offcuts. 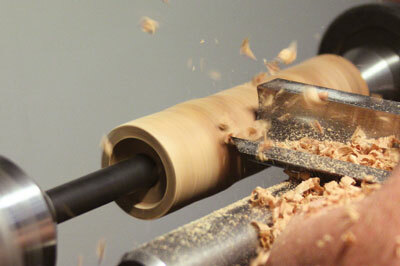 I used a combination of improvised metal and wooden mandrels to mount the wooden components on the lathe. Transfer punches mounted in a keyless or Jacobs chuck make useful mandrels and Kurt Herzog gives some helpful tips on workholding aids and mandrels in the May 2012 edition of Woodturning. 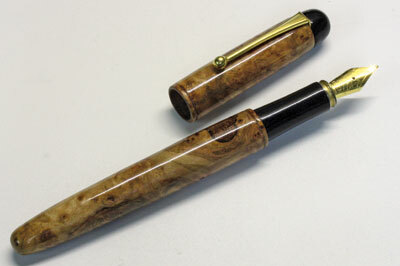 The pen was finished using cyanoacrylate adhesive which was also used to fill voids in the burr myrtle. 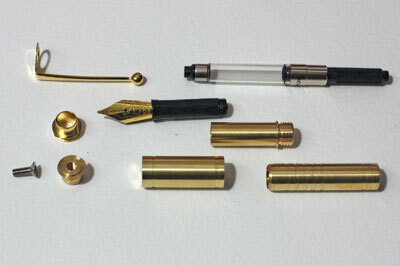 These kits are not inexpensive nor are they aimed at the beginner to pen making, but for the turner who wishes to extend his or her pen making beyond the limitations of the usual kit based designs they provide an excellent source of high quality components that will enable the skilled turner to produce writing instruments comparable to those of the top professional makers.